"...although it is currently fitted with the 'sport' pod & instrument panel as the picture shows, it also has a brand new red/silver full-body fairing & rear luggage trunk available for only $1000." Click on Picture for Details. AirCreation GTE 582dcdi with Kiss450 wing, In-Flight Adjustable Trim, Full Instrumentation, Red 4-blade Arplast Helice prop, Electric Start, Full Instructional Package, Finned Wheelpants & more... And, only 40 original hours. Now, check this out; although it is currently fitted with the 'sport' pod & instrument panel as the picture shows, it also has a brand new red/silver full-body fairing & rear luggage trunk available for only $1000. 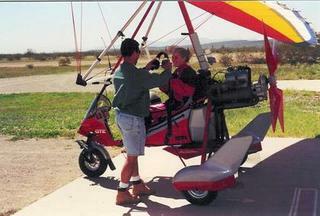 This option would make this trike a full Clipper easily worth over $30K on the new market and add the necessary wind protection if you're a winter flyer, crosscountry flyer, or just apprectiate the feeling of having a shell around you. Although price is typically irrelevant when a pilot is seeking the perfect plane, it's nice to know that you could fly this aircraft for at least 3 years and see absolutely no depreciation in respect to the price we're asking. Unique, this plane, owner & it's history is another that we know personally. The plane is in New Jersey, but the owner is absolutey meticulous & would be more than happy to talk you regarding the plane. It is two years old but was only flown a couple weeks before it sat in storage when the owner took a liking to his 912/Ixess a little more. Go figure... Again, it is in perfect condition with around 40 hours total. This trike would normally cost as little as $27,600 or as much as $29,000 new, pending foreign currency exchange rates & shipping, complimented by a 10-week leadtime... Addtionally, the Clipper fairing & aft luggage compartment option would normally add another $3500 to this price. It is for sale at $21,500 + $1000 for the Clipper Fairing. We're confident that this aircraft will sell at Sun-n-Fun, so if you're interested please call soon for a complete list of options & equipment or if you'd like to speak with the owner.